Heart, Soul, Mind and Strength… which dimension do you lead from? Take this FREE personal leadership assessment to find out! READ THE BOOK WITH YOUR TEAM! a free copy of The 4 Dimensions Leader’s Guide designed to help you and your team move from ordinary to extraordinary leadership. Go to the retailer of your choice, listed below, and order 10 or more copies of The 4 Dimensions of Extraordinary Leadership. Once we receive your email, we’ll email you back the PDF copy of The 4 Dimensions Leader Guide. I have had the honor and privilege of working with church leaders around the world and across many denominations and sizes, and one of the things that I have discovered is just how crucial it is for leaders to be cultivating and raising up extraordinary leaders around them. In her new book, The 4 Dimensions of Extraordinary Leadership, Jenni Catron has established a framework for leadership development that is exceptional! If you are looking for a resource to help you grow your team, grow your leaders and grow your influence to the world around you - this book is a must-read! Leadership is never just a title and is always a lifestyle, an all encompassing set of decisions that change the way you look at every facet of your life. I'm so glad that Jenni has captured that so succinctly in her own life and now in this great book! Straight from the heart of a gifted leader, Jenni Catron delivers a life-saving road map for leaders to live out all the dimensions of Jesus’ great commandment to ‘Love the Lord your God with all your heart, soul, mind, and strength. While I believe that some people are naturally gifted to lead, great leadership still takes work. Jenni Catron is one of those people who is a super sharp leader AND knows what it takes to grow and become an even better leader. That's why I love her new book "The Four Dimensions of Extraordinary Leadership". Throughout this book, Jenni clearly maps out what it takes to excel in your leadership and pairs it with her quick wit and personal experiences. Everyone that applies these leadership principles is guaranteed to see positive results. Leadership by its definition is lonely and complex, in Four Dimensions Jenni Catron gives great encouragement to leaders by breaking down the complexity and emphasizing the necessity of Christlike, God-centered leadership; this book is a great companion for anyone called to lead. Extraordinary Leadership is possible when we consider ALL of the elements necessary to make it so. What Jenni has done in this remarkable book is just that...heart, soul, mind and strength. She takes us on a deep dive in each of these four elements, then weaves them back together in to an integrated whole. Both her leadership experience and who she is as a person makes her uniquely gifted to write this book. I am guessing you will return to it over and over. I have. I get to work with some of the best leaders on the planet, and I will be recommending this book to each of them. Jenni takes lessons on leadership from ordinary life and lifts them into extraordinary teaching. A must read for growing leaders! Jenni Catron creates a new framework for understanding leadership that aligns with God’s command to love him with whole heart, soul, mind, and strength. Through new and familiar stories about high-profile leaders, she highlights each aspect of their ‘wholeness’ and beautifully amplifies the gaps between ordinary and extraordinary leadership. Insightful and practical, this book is for leaders who want to know where they are and what it takes to become wholly extraordinary. Jenni Catron is one of my favorite leaders and it's fitting she's written a book on extraordinary leadership. Jenni models this and it is a gift to the rest of us to help understand her approach to serving and leading from these four dimensions. I am better leader because of Jenni. I believe by reading this book you will be too. As a leader of several fast-growing companies, I can tell you that Jenni Catron is the real deal. Her writings provide timeless truths that apply to leaders in any industry or organization. Jenni speaks from the heart, processes with her mind, leads with passion from her soul, and inspires with her strength. She’s genuinely kind and sincere, in addition to being a hugely powerful force in leadership conversations – which shouldn’t be so rare, but it is. Jenni embodies the 4 Dimensions, and has been a tremendous source of encouragement to me. You will walk away from any encounter with Jenni – either in person or through her writings – a better leader than when you started. The Four Dimensions of Extraordinary Leadership should be required reading for anybody that wants to lead. This book gives a wholistic approach on how to be a great leader that lasts the long-haul. As anyone who has interacted with Jenni can sense, Jenni is a world class leader. Drawing from her experience in the corporate world and from serving in two leading, progressive churches, Jenni shows you how to become the leader you've longed to become. It's wonderful to see something as aspirational and spiritual as leading with all your heart, mind, soul and strength become both practical and realizable. This is a great book that will help many, many leaders. Many people complicate the magic of extraordinary leadership. Jenni Catron does an amazing job of simplifying what incredible leadership looks like. Not because it’s easy, but because it’s attainable to all who desire to be great leaders. You have to work at it and I’m so grateful Jenni is providing leaders a North Star to look at and pursue. Jenni Catron's latest book is a treasure chest full of wisdom on how to lead well. The Four Dimensions of Extraordinary Leadership is a must read for every leader. Both young leaders and more seasoned leaders will find insights, new perspectives and encouragement. Through her incredible experience and keen observations, Jenni offers unbelievable insights into leadership. If you have ever felt prompted to lead with all of who you are, then The 4 Dimensions of Extraordinary Leadership is a must read. Jenni is no ordinary leader… She lives, loves & leads wholeheartedly which is what makes her extraordinary. She leads from her heart, soul, mind & strength. She practices what she preaches and she invites others to do the same. If you are looking to be an extraordinary leader make sure you put The Four Dimensions of Extraordinary Leadership at the top of your reading list. You will be challenged and coached through this book by one of the very best. How do you define "Extraordinary Leadership?" What qualities do "Extraordinary Leaders" have? How can you move from "Ordinary" to "Extraordinary?" 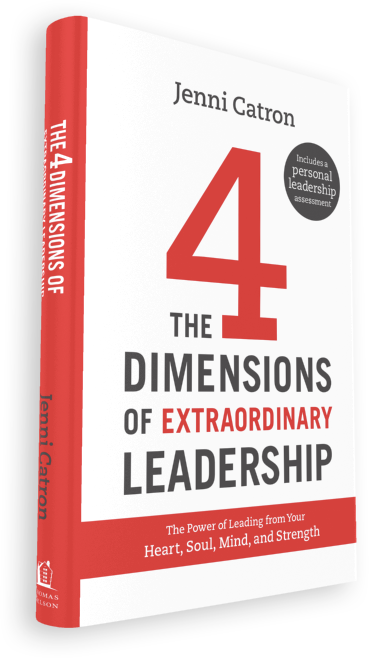 Jenni Catron's "must read" new book, "The Four Dimensions of Extraordinary Leadership" will help you discover your own answers and assist you in plotting your course from "Ordinary to "Extraordinary!" The four dimensions of extraordinary leadership is just that…extraordinary. This book is a roadmap on how to be a better leader. If you care at all about developing your gifts in leadership you need to read this book.